A considerable reduction on maintenance efforts and time and better ergonomics are some of the wanted side effects of this new development. The PCB industry is facing the challenges of increasing quality and performance demands for through hole filling processes (THF) with higher aspect ratios and higher hole densities.Atotech’s Uniplate® Cu InPulse 2 Advanced plater offers the solution for the PCB with an improved design. Main advantages contain inclusion-free filling of high aspect ratios with high hole density and uniform surface distribution through process control.Atotech’s Inpulse® IP2 Advanced Plater is providing void-free Through-Hole filling mainly for the IC substrates industry. Filling of through holes with pure solid copper in HDI boards and IC substrates is one of the latest innovations in plating technology. Through hole filling is combined with a minimum copper deposit on the surface of the panel. In case of build-up technologies, this process eliminates the plug plating step which is normally followed by brushing, second desmear and second electroless copper process prior to lamination of build-up layer. Thus the “Through Hole Filling” process has high potential in reducing manufacturing costs. 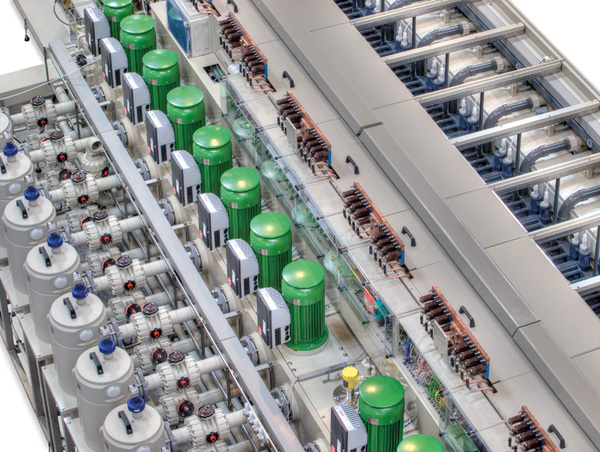 The InPulse® 2 Advanced Plater is keeping all the advantages of the standard InPulse® 2 Plater and improving drastically fluid dynamics, enhancing monitoring and control devices. It is minimizing pressure losses through optimized piping without mentioning the new designed anodes granting the reproducibility of the results. Paste plugging process for through holes requires additional process steps, each of which has its own limitations and contributes to the overall cost. Complete Through Hole filling for cores by a copper electroplating process is needed as an alternative. Inclusion free through hole filling is required to overcome the risk of migration of inclusion by applying current and heat during use of final product. This migration may lead to a delamination/ separation of the interface connection to the next layer. Uniplate® IP2 Advanced provides the equipment to lever all the benefits of our Inpulse2 THF electrolyte. Inpulse® 2THF is the world’s only inclusion-free plating process for through hole filling enabled by our patented Bridge-Plating technology. It has been proven in mass production since 2013. The combination of Inpulse 2THF process together with the Uniplate® InPulse® system provides unsurpassed surface distribution in panel plating. In combination with Atotech’s patented Superfilling technology minimum surface plated copper and low dimple filling performance, leading to low cost through hole filling.